The snow has melted, there’s a glimmer of an approaching spring in the air, and runners everywhere are putting away their YakTrax and replacing them with racing flats: the spring racing season is upon us. This weekend is the LA Marathon, the NYC half, approximately 8 million St. Patrick’s Day races, and—closest to home—the Rock-n-Roll DC Half. Like every year for the last six years, I’ll be running Rock-n-Roll DC, but “racing” it is probably the wrong word. I’m not being defeatist when I say this, but I will not be going for a PR. (Being realistic is a rarity for me; I don’t think I’ve ever said I’m not planning to PR on this blog before.) I know the shape I was in when I set my current PR (1:19:28) and I am nowhere near that. I can barely run 2 miles at that pace, let alone 13. And that’s okay, my peak race is still 3 months away. But it’s a shame, because it will be a blemish to a perfect record at this race. I’ve PRed here every year, including 2010 when I ran the full. From 2009’s 1:34:39 (my first ever half) to last year’s somewhat disappointing (but still PR) 1:21:37, DC has been good to me. 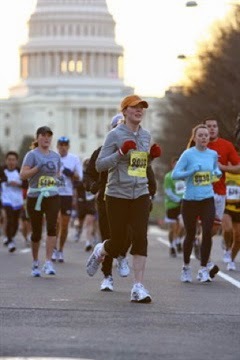 In light blue on the right, running my first half in 2009. I can’t help but compare it to Philly, where the reverse is true. My record for the DC half is 6-0, but my record for Philly is 0-7*. (I’ve conveniently manipulated these statistics to not include all other DC races, where my record is far from perfect.) 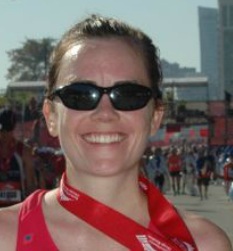 As I think about my plan for this race, I have flashbacks to my last race in Philly, another half I was unprepared for. I crashed and burned as the Curse won once more. I don’t want a repeat of the demoralizing second half of Philly, so this time I’m going in fully accepting it will be a tough workout. I’m hoping a realistic outlook will help me nab a solid workout and put me on track to shoot for a PR later in the season. Maybe the luck of DC (or the luck of the Irish?) will give me a little boost as well. Good luck to all those racing (or running/working out/whatever) this weekend! *Update to the Curse: I did go for a run in Philadelphia when I was there a couple weeks ago, and—aside from getting caught in an ice storm on the drive home—there seemed to have been no running repercussions. Are the tides turning? On May 3, we’ll know. Saw you did great at the race this weekend - that's a great time for so early in the season! Nice job! I'm (selfishly) glad to hear you are running another marathon before the trials because I like following along with your training! Hoping your speedy vibes will rub off on me. :) Great job on the half!